The School of History, Welsh History and Archaeology has a new doctor in the house, after Dr Owain Wyn Jones successfully passed his PhD viva examination on the 8th of January. ‘The viva was a very enjoyable experience in the end – it was nice to be able to discuss the topic with examiners who were so familiar with the field of study. I was particularly pleased that David Stephenson and Julia Crick saw strengths in what I worried were weaknesses in the thesis. I received so many useful comments, and I’m very grateful to my examiners and supervisor for all their guidance’. 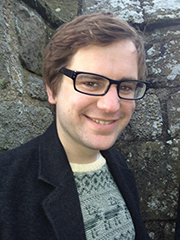 Owain will be teaching a Welsh medium module in The School of History during Semester 2 called Môr-ladron a Brenhinoedd y Môr (Pirates and Sea-Kings), and will be working on developing his thesis for publication.